The UNE Business School Innovation Challenge offers high school students across Northern New South Wales a great opportunity to develop their best business ideas. The best business ideas solve a problem. Students can work on a shared problem, brainstorming ideas for an existing business, or come up with business ideas that they have been building in class or at home. 20 finalists will be awarded the chance to work with experienced thought leaders, developing and presenting at ThePitch! Competition and Showcase. The selected students will be invited to UNE for a day to work with celebrity coaches to develop a pitch for the ultimate challenge! ThePitch! Competition is an exciting and intensive design process to develop a pitch. Students will work alongside students from other schools in our region with a team of young, vibrant business coaches who know how to develop ideas and deliver a pitch. Students will gain valuable skills to solve problems, meet business professionals and have fun completing a business pitch at UNE. The 20 finalists will be in the running to win a cash prize! Students from participating schools are all invited to participate in the event at UNE, Armidale on 18 November 2016. Not only will your students have the chance to cheer on their classmates, they will have a chance to hear from our speakers on how great ideas can grow and be built into business opportunities. Students can also expect an exclusive chance to tour UNE’s recently announced SMART Region incubator! The following handbook is designed for teachers to support their students in entering the UNE Business School Innovation Challenge. The UNE Business School will be available throughout the lead up to the event, to introduce the event to your students and support school students and teachers to become involved. Need help or advice? Contact us! Did you know most good ideas come to the surface by accident! In the shower, while we sleep, run, groove, play ping pong, talk to friends, daydream, talk to your brains trust and in the classroom! The UNE Business Challenge is looking for ideas to solve a problem, because that’s what gives ideas a future. You could work on a shared problem (something you care about…or something your community worries about) or you have an idea for a business you would like to play with. Or you could look at a business within your region to brainstorm some ideas to build the business or take it in a new direction. Get in touch with us via businesschallenge@une.edu.au to request your personal classroom resource pack – this will assist with brainstorming with your students in the classroom – we hope this can be a fun, creative exercise! Register with us (via email) to receive the Brainstorming Pack - a huge pad of Post-It Notes, some markers and a big bag of lollies will be posted to you to help those brilliant ideas flow! UNE Business School’s Liaison Officers Dave & Helen are another resource you are able to call on – we’re happy to come to your school to run a workshop with your students, taking a closer look at those great ideas and helping your students to refine and clarify their entries to our competition. We’re here to help – we’re excited to hear from your students and support your classes in encouraging some great ideas! Do you have an idea for the next ‘Pokemon Go’? New ways to learn, ideas to make learning easier – not just at school! Do you have an idea to help students remember all the answers for exams? Do you have an idea to make a difference to a farmer’s daily tasks? Do you have an idea to help Australia win more gold medals in 2020? Do you have an idea to help families avoid the common cold every winter? Do you have an idea for an awesome weekend activity? Have we missed out the right category for your great idea? No problem! Go to "Enter my idea" and complete the form. 1. Tell us your idea! Explain your idea in 50 words or less. 2. What solutions does your idea give the world? Explain to us why your idea is a great solution to a problem, or how it creates something new in 50 words or less. 3. What's the hook or innovative twist? Tell us how you'd market this product or pitch your idea to a panel of judges in 50 words or less. Once submitted, confirmation of entry will go through to the email address supplied. Everything we do involves pitching, it’s a skill that we can learn, it’s telling a story about an idea that nails it! 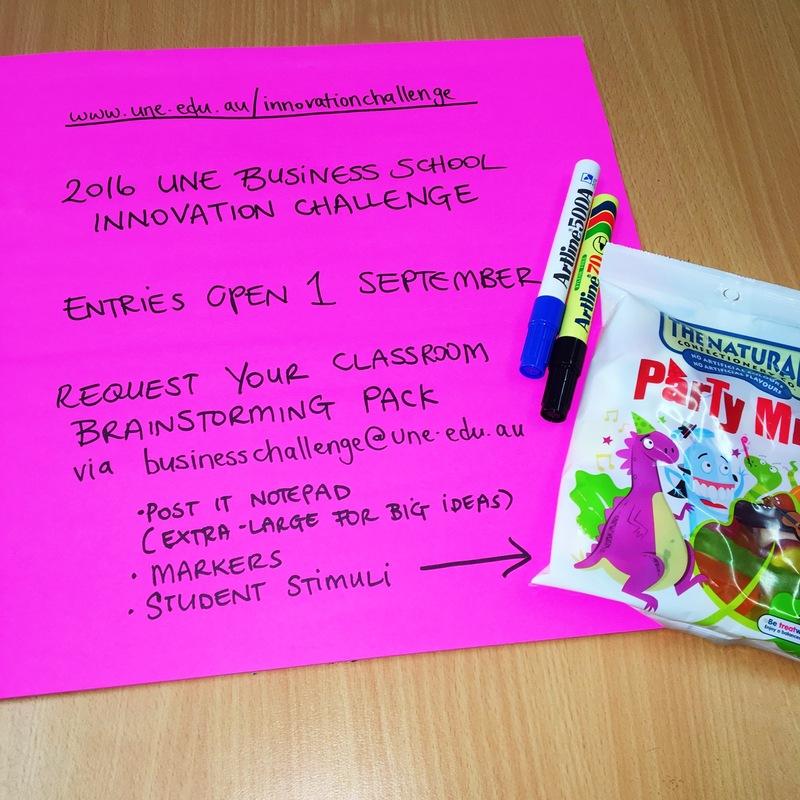 The 2016 UNE Business School Innovation Challenge offers 20 students a chance to work with creative coaches who will help to deliver their pitch. All student participants on the day of the event will enjoy some interactive work with our guest presenters, including some keynote speakers from local businesses. This event is an opportunity for students to understand our local business community; to have a taste of how to succeed in building a new business, as well as to understand how important innovation and change can be for regional and rural areas. This event on November 18th 2016 is not just a day for the 20 finalists – we will be engaging your students all day! The following table shows the intended program of activities at the ThePitch! Competition (subject to change). a) What problem does your offering solve? b) What is your product or service offering and how does it work? c) What is the market for this idea? d) What is your unique value proposition and why does your offering solve the problem better than its potential competitors? e) Can the associated intellectual property be protected? a) How will you market the offer? b) What is the intended manufacturing or service delivery process? c) How will it be distributed or provided? d) Is there any environmental impact associated with the product or service? e) How convinced are you by the team’s pitch that this is a strong business idea? a) How much investment is required? b) How will your business make money? c) What return on investment is predicted? d) How long will it take to pay back the investment? e) What long term security does this business idea have? Have data been displayed thoughtfully, clearly in tables and/or labelled graphs? What is your assessment of the accuracy of the data? (Eg. techniques used to collect data and use of repetition)? How well do the images and diagrams included support the description of the project or method used? How clearly have the students stated their conclusion(s)? How attractive and visually appealing is the student’s display? How clearly have the aim, method, results & the student’s conclusion been communicated on the display board? How effective was the student’s delivery? Did s/he maintain good eye contact, speak clearly, articulate ideas effectively? Was the presentation delivered coherently? You have asked the questions and looked at the display details. What is your overall impression of this project?